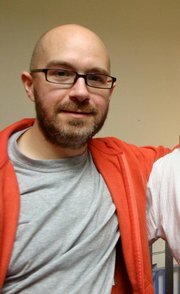 THE BODY of missing Irishman Paul Nolan Miralles has been spotted in an Amsterdam canal. Tragically for the family of the photographer, however, he has yet to be retrieved from the water. The 36-year-old, who has been missing since last Wednesday, is now believed to have fallen into a canal in the Dutch capital. At the time he was on his way home after a night out in the city centre with friends. He is then believed to have been hit by a passing pleasure boat. It is not known yet if he was dead at the time. His sister Anna Ravanona said: ‘His body has been sighted. It was spotted on Tuesday. ‘Although we have yet to be able to retrieve him, police have found a body part and that is being sent for DNA testing. Paul’s jacket and his bag have also been found, although not the bike he cycled home on.The discovery of one a body part – which has yet to be identified as Paul’s – has compounded the family’s heartache since he went missing. However, the family are believed to be furious about the conduct of Amsterdam Police at the early stages of the search for Paul. Friends of the former Dublin DIT photography graduate – who had lived in Amsterdam for ten years – have told how the family have had do to much of the initial searching by themselves. Although the family last night refused to comment, they were said to have brought two police officers over from Spain. The men are believed to have been drafted in to ‘discreetly assist and advise’ the family in their frantic search for Paul, whose mother is Spanish. The family also had to source their own sniffer dog and have even had specialist sonar gear flown over from NUI Galway, which arrived yesterday morning. The Facebook page set up by Pauls family. The sniffer dog was ‘borrowed’ from a team who had recently returned from searching for victims of the Japanese Tsunami. Almost immediately it picked up Paul’s scent at the city’s Hard Rock Cafe, where he worked. It led members of the family to the Passeerdersgracht canal nearby. But despite its success, Amsterdam Police are said to have refused to carry on using the dog – which is trained to find dead bodies. They instead brought in their own and finally deployed an underwater search team. Friends of Paul have also heard of long delays in the deployment of technology to track Paul’s mobile phone, which is believed to have still been on last Sunday. Paul was last seen around 3.50am when he said goodbye to friends after a night out with friends at the celebrated night out with pals at the celebrated Whiskey Cafe L&B on Korte Leidsedwarsstraat. Although friends described the popular photographer as being tipsy, he declined their offer to walk him back to the Hard Rock Cafe – where he worked – nearby to collect his bicycle. 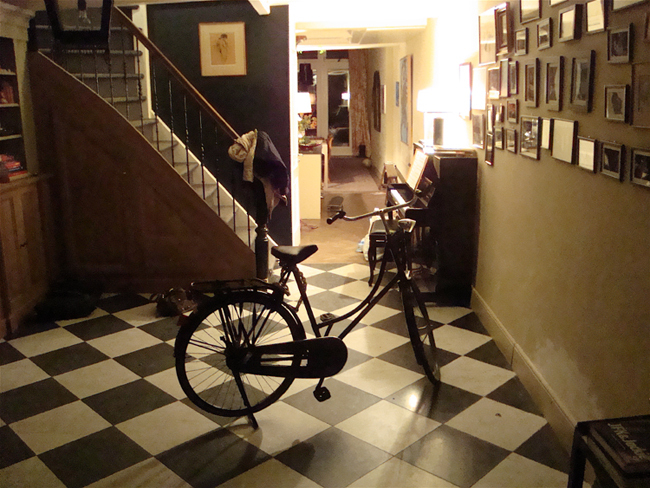 He then set off on the 15-minute, 4km cycle home to his home in Statuinenweg. To get there, he would have had to cross at least four canal bridges. Alarm bells started ringing when he failed to turn up for work and colleagues immediately rang members of his family. It is mainly their action and persistence that finally galvanised the Amsterdam Police into action. They had circulated 1,000s of posters with a picture of him and visited scores of hostels and even homeless shelters on the off-chance anybody saw him on the night he disappeared. from Clonsilla in Dublin, and his Paris-based sister Anna. She said that his disappearance had been ‘completely out of character’. His 27-year-old German girlfriend Elsa Wirrig said that the couple were due to go on a romantic Easter break in Rome or Barcelona. As far as the conduct of Amsterdam Police is concerned, Paul’s sister Anna refused to discuss the matter. She said: ‘I do not want to comment as the family are concentrating on the job in hand. ‘We have found parts of Paul’s coat and bag and part of what we believe is his shoulder. ‘As far as our conduct is concerned, we do wait a little longer in a missing adult case than we would if a child goes missing. ‘But we have done what we can – we checked hospitals, his phone records and all the CCTV footage from the area. ‘To us every missing person is the same but the family of each missing person will always do what they can themselves. ‘If they can come up with a development that helps, then we act on it. But she added that the search is now being scaled down. She said: ‘We have been looking for him now for four days and we now have to wait for the rest of his body to surface. 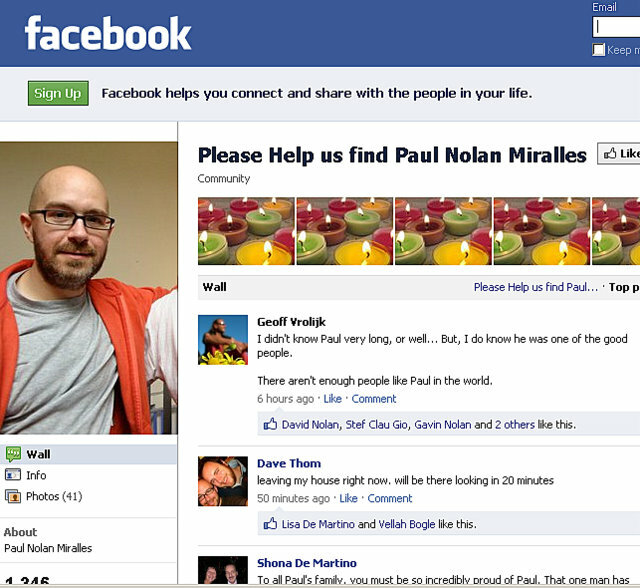 A sign of Paul’s popularity can be seen in the the hundreds of messages posted on the Facebook page the family set up during their on-going search for Paul. Previous Previous post: Has Twitter the jitters over Dublin for European HQ?